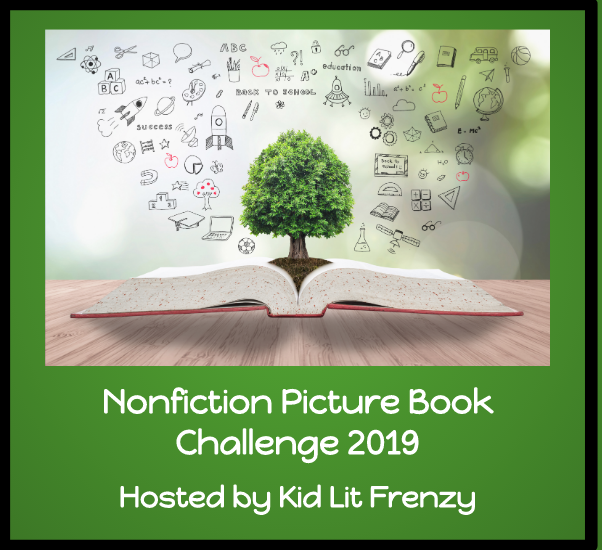 TeacherDance: Non-Fiction Picture Books Reveal! This longer biography/picture book (out yesterday!) is for young adults and it is not too long for readers but covers all of this magical dancer's life whose name many know, yet perhaps only that he was an early dancing genius. Those who dance will adore seeing how he lived and pushed for perfection in his work; those who do not dance will gain a greater appreciation for dancers as athletes, learning about this man who brought new ideas for his passion. 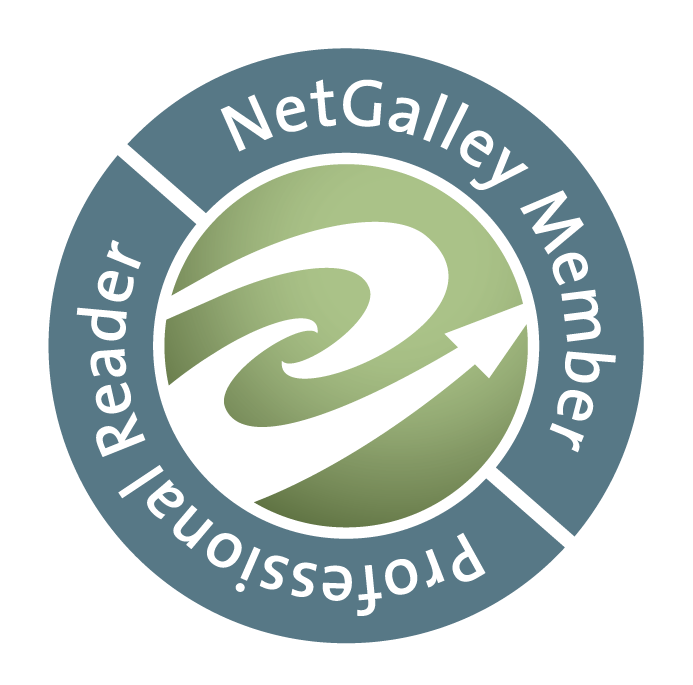 Thanks to Charlesbridge for the copy. 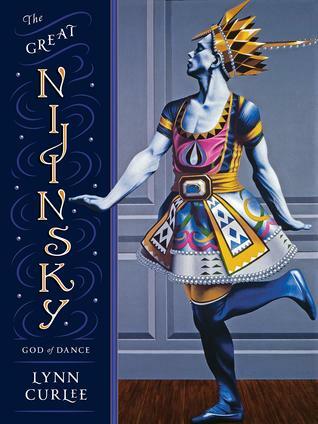 One can look at the story of Nijinsky as a celebration of the life of a gifted genius. And it also serves as a memorial for a man whose dancing life veered onto a path of ill-advised choices. These led to the tragic second half of his life in and out of asylums, not on his beloved stage. Lynn Curlee began extensive research into Nijinsky's life after seeing photos of him in costume. Before this book, years ago, he found photos that entranced him and began creating life-size, full color paintings of them which became part of his first show as an artist. Within meandering between the genius of Nijinsky's dance and his departure into other art, Curlee was pulled again into Nijinsky's life. Curlee begins with Nijinsky's birth to Polish performers, through the early recognition of his gifts and his schooling in dance at the Imperial School of Ballet then the Imperial Ballet. Most of the content does focus on Nijinsky's art, his dancing and choreography, and some on his personal life, especially his time with the Ballet Russes. 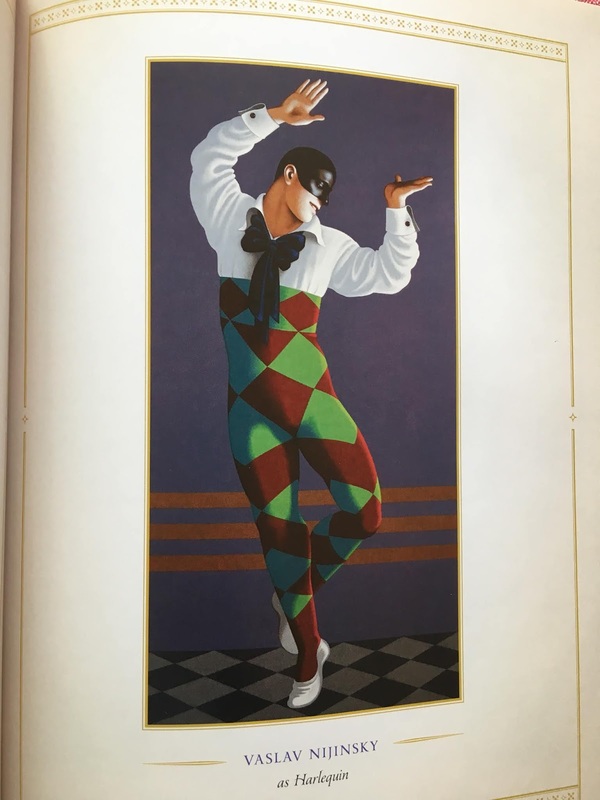 There are short bios of important artists in the dancer's life, like Diaghilev and Stravinsky, with whom Nijinsky crossed paths as well as the sharing of Nijinsky’s romantic relationships. Even as a young man, he struggled with his sexuality, has most relationships with men, but then did marry a woman in the late part of his career. There are a few descriptions that discuss his sexual experiences. 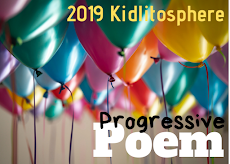 Despite his personal and then professional struggles, one happy part shares a bit about his loving relationship with his daughter. What was of great interest to me were the creations of programs detailing various ballets that Nijinsky performed or choreographed, including descriptions of the ballet’s history and plot and paintings by the author. Beautifully entrancing in the parts he played, it was sad to read that only a few photos of him are available and not one, even brief, film of his dancing. 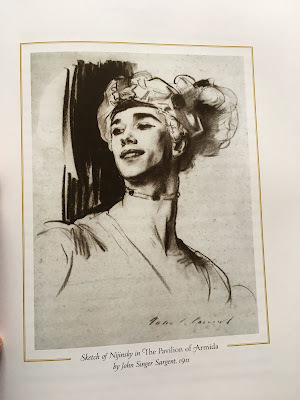 I enjoyed the direct quotes and added illustrations of paintings of Nijinsky like the one below, by John Singer Sargent. In an epilogue begins with a quote from an earlier biography by Richard Buckle: "Ten years growing; ten years learning; ten years dancing; thirty years in eclipse." An author’s note, a list of performances, source notes, bibliography, image credits, and an index can be found in the back matter. A great example of a book whose cover definitely catches one's eye. Will have to look for this. Yes, Curlee's art is marvelous and the story is one I'm glad to know, though it is sad toward the end. Thanks, Earl.